Recap: The U.S. economy offered varied evidence of underlying strength in late August during a period of wild swings in global stock prices and anxiety over signs of an economic slowdown in China. 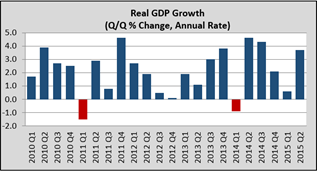 Gross Domestic Product (GDP) expanded at a 3.7% seasonally adjusted annual rate during the second quarter. Other recent reports showed gains in consumer confidence, retail sales and home building. Still, the second quarter rebound after a weak start to the year, appeared unlikely to presage substantial acceleration for an economy that has been held back for years by low productivity growth, slow wage growth, reduced share of Americans in the workforce, and hesitance from businesses and households to spend. While the first half's growth rate of 2.2% was better than expected, economic growth so far this year has been even slower than during last year's tepid first half, and well below the pace of the overall recovery. This year's tepid first quarter reflected a variety of factors that continued to weigh on output in the second quarter, including a stronger dollar, sluggish business investment, and choppy consumer spending. But there have been signs those pressures may be starting to ease. The housing market has built momentum after years of uneven recovery. Housing provided a boost to the economy in the second quarter, amid signs of strong activity during the spring selling season. Residential investment advanced at a solid pace. And the unemployment rate, so vital to consumer spending and economic activity, fell to its lowest level since 2008 in July, as U.S. employers added jobs for the 58th straight month—the longest stretch on record. Strong job gains and accelerating wage growth supported stronger household consumption in the second quarter. Government spending rose modestly after falling earlier this year, reflecting higher spending by state and local governments. And trade, which had dragged down the GDP number for four of the previous five quarters, added to economic output in the second quarter. Yet for all the positives, the economy still doesn't seem to be clicking on all cylinders. One persistent weak spot has been business investment reflecting a sharp drop in spending on structures, as energy firms have scaled back their investment plans this year following a steep drop in oil prices that began in mid-2014. Oil prices have been volatile but appeared to have stabilized until recently when prices slipped again, a sign that those pressures could continue to weigh on growth in the second half. Federal Reserve officials have been filtering a range of conflicting signals as they consider a decision about whether to raise short term interest rates from near zero at their September policy meeting. Stock market gyrations, an economic showdown in China, commodity price declines and a stronger dollar have added elements of uncertainty to the U.S. outlook and heightened caution among some Fed officials. But signs of solid economic growth during the second quarter could strengthen their resolve to take action. Real GDP: Real GDP increased by an annualized 3.7% in the second quarter of 2015 according to the revised estimate, up strongly from the 2.3% initial estimate. The sheer magnitude of the acceleration in GDP growth and the breadth of the improvement would indicate that the U.S. economy is in fact on a solid growth trajectory. 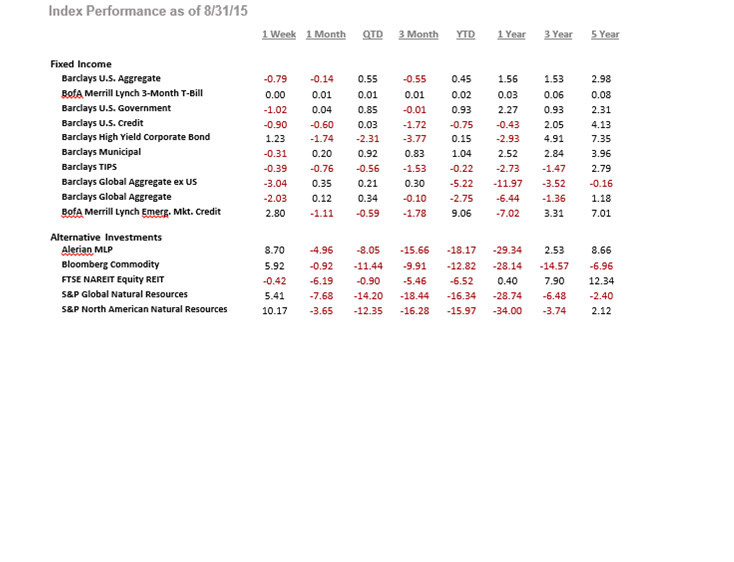 Going forward, some economic drag is expected from energy investment and the strong dollar. At the same time, falling gasoline prices, rising employment and income, and improving household wealth should enable the U.S. consumer to carry the economic momentum forward. U.S. economy should grow at a 2.5% to 3% pace over the coming quarters. 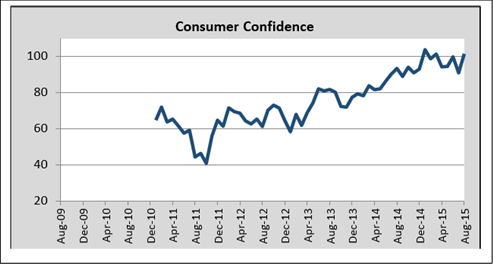 Consumer Confidence: The Conference Board's measure of consumer confidence rose 10.5 points in August, after posting a sharp decline in July. 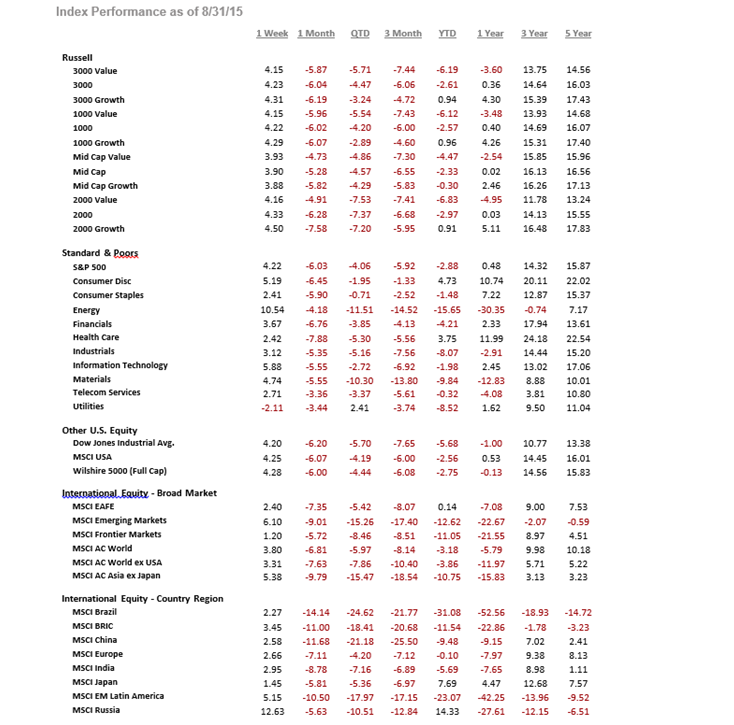 This reinforces the view of consumer spending remaining the key support to economic growth over the coming quarters. Real consumer spending growth should come in around 3.0% in the third quarter. The biggest potential risk remains the magnitude by which the current equity market volatility results in reduced consumer confidence. Should confidence erode in a dramatic way, there could be greater downside risk for consumer spending and overall economic growth. 0.4% in June after rising a revised 0.4% in May. But wage growth slowed unexpectedly in the second quarter, which could have damped Americans' enthusiasm to spend. These latest figures set up a soft trajectory for consumer spending heading into the third quarter. Spending gains are expected to lag income growth as an aging population seeks to boost retirement savings and also struggles with healthcare costs. Inflation: Extending the string of increases to six months, the headline Consumer Price Index (CPI) edged up 0.1% in July with a matching gain recorded in the core CPI. On a year-over-year basis, headline consumer price inflation rose to 0.2%, up from the 0.1% reading in June. Core CPI was up 1.8% y/y, unchanged from the month prior. Headline prices remained subdued due to lower energy costs, while downward pressure from the dollar's rise on consumer goods continued to weigh on core CPI. Metals, crops and livestock. The breadth of these declines can be tied to renewed jitters over the slowdown in the Chinese economy, which has been a major source of new demand for raw materials over the past decade. In addition, after little change between March and June, the dollar has resumed its upward trend. The broad trade-weighted dollar index has risen 2.6 percent over the past month, as the Greek debt crisis and Chinese stock market turmoil reaffirmed the prospect of U.S. monetary policy soon diverging from the rest of the world. After a steady run in May and June, oil prices have fallen more than 20 percent since the end of June, while the CRB metals index has fallen to the lowest level since 2010. Core and headline inflation are expected to move gradually higher in the second half of this year. Clearly, the renewed slide in commodity prices as well as an appreciating U.S. dollar adds downside risk in the near-term. Even with that in mind, Fed officials still appear to be "reasonably confident" that inflation will "rise gradually toward 2 percent over the medium- term." 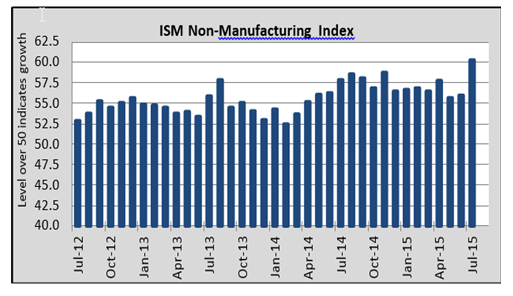 ISM Manufacturing: The Institute of Supply Management's (ISM) manufacturing purchasing managers index fell to 52.7 in July from 53.5 in June. A reading above 50 would indicate that the manufacturing economy is generally expanding. The July numbers are the latest in a string of mixed reports for U.S. factories, which have struggled to overcome a stronger dollar, weak overseas demand and a rocky first quarter. The surveys would suggest a manufacturing sector that has yet to shake off the malaise that has been apparent since the end of last year. non-manufacturing index surged 4.3 points to 60.3 in July. All but one subcomponent gained on the month. After sliding lower in recent months, the employment subcomponent rebounded strongly in July, rising to the highest level since the onset of recovery. Business activity and new orders also recorded hefty gains. Of the 18 non-manufacturing industries surveyed, 16 reported growth and only two (mining and other services) reported having contracted in July. The Data has continued to point to a growing divergence between the manufacturing and non-manufacturing sectors. Faced with the surging dollar and uneven global growth, U.S. factory activity has shifted into lower gear this year. Meanwhile, these headwinds are less of an issue for non-manufacturing industries that are more domestically-oriented. Going forward, the non-manufacturing sector is expected to continue to benefit from multiple tailwinds, including rising employment and incomes, and accelerating activity in the housing market. Housing: Housing starts increased to 1,206 thousand (annualized) in July. Figures for the last two months were revised upward. Single family starts rallied in the month while multi-family starts, on the other hand, pulled back. Building permits declined sharply, with most of the declines in multi-family permits. Both the Northeast and Midwest recorded gains in housing starts, while the South and West saw a slightly slower pace of homebuilding during July. New home sales rose 5.4% in July to a 507,000-unit annual pace. Sales activity increased in all regions but the Midwest, where activity fell for the third straight month. The level of inventories, which has constrained sales in previous months, edged higher. Since the beginning of the year, inventories are up almost 5%. The favorable report reflected increasing household formation and stronger income. This report confirms the view of continued, if only gradual, improvement in the U.S. housing market. Perhaps the most encouraging element of the report was the strength exhibited by the single family segment, with homebuilders breaking ground on nearly 50 thousand more single family homes in July than at any prior point during the recovery. A continuation of improvement in this previously lagging segment would be a clear signal that confidence and incomes gains are finally manifesting in the housing market. It would also be a welcome boost to economic growth and provide a fresh signal to the Fed that the long awaiting change in interest rate policy can begin. goods in the global market while pushing down the price of foreign products that flowed into the U.S.
Exports are not expected to see much positive momentum over the remainder of the year. The weakness in capital goods on both the import and the export side of the ledger also point to the impact of a struggling global economy and falling commodity prices on investment. Fortunately, the worst of this drag is now over and business investment should improve in the months ahead as activity should rotate toward meeting greater domestic consumer and housing demand. Global Market: Global markets have put Greek exit fears behind them, only to be replaced by worries about Chinese growth and tumbling commodity prices. Chinese equity markets plunged early in July, increasing investor jitters about its economy, and leading authorities to step in to stem market losses. China's economy has been transitioning to a slower more sustainable growth path, which will be a weight on demand growth for many commodities. Moreover, there is a high likelihood of similar episodes of market volatility in the future. Chinese authorities have continued to navigate the trade- offs between making progress on long-term reforms, and maintaining near-term economic growth close to their target. Worries about the state of China's economy, and hence demand for many commodities, has been a key driver of the recent tumble in commodity prices. A strengthening U.S. dollar and rising short-term money market rates in the U.S. in anticipation of Fed hikes this fall have also played a role. Since most commodities are priced in U.S. dollar terms, when the U.S. dollar appreciates, commodity prices typically fall. Rising U.S. short-term interest rates will increase the "cost of carry", i.e. the interest cost many investors incur to invest in commodities, thus reducing the attractiveness of the asset class. Within the global oil markets, oversupply has persisted as OPEC has continued to produce above its target and U.S. shale output has yet to slow. The sustained lower price environment is required to reduce investment in the sector further, eventually leading to the production declines necessary to work down the supply glut. This is also expected to sow the seeds of higher oil prices later in 2016. Outlook: The second half of the year looks to be a lot better than the first half. While the dollar strength and drag from net exports will likely continue, the hit is unlikely to be as large as the 0.9 percentage points it averaged in the past three quarters. At the same time, the drag from falling oil drilling activity is unlikely to persist. 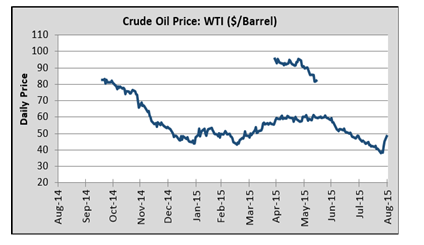 Moreover, the economy should increasingly receive support from sectors that benefited from cheaper crude oil price. Already, investment in manufacturing structures has surged. Still, a larger benefit is expected in personal consumption. Spending has risen by a healthy 2.9% in Q2, as the American consumer, faced with smaller gasoline bills, had more money left over for other goods and services. In their last statement, the Fed provided a relatively upbeat take on the economy, suggesting that interest rate hikes would begin after "some further improvement in the labor market." The addition of the "some" qualifier would indicate that the Fed is becoming increasingly comfortable with economic progress to pull the rate lever. While wage pressures remained limited, core inflation appeared to be heating up according to the Fed's favored PCE deflator measure. Ultimately, the Fed decisions will be data dependent. If the labor market should continue to improve and core inflation tracks higher, an earlier start to a more gradual tightening cycle, suggested as a "prudent approach" by Chair Yellen, should be expected.